My, my, my this place is fabulous. Large open floorplan with downstairs den, bedroom, and bath along with a wall of glass opening to the deck and stunning ocean views. Up a small stair rise you enter the dining area and another wall of glass and yes another balcony to sit and enjoy your morning coffee and views. The kitchen has all the stainless and storage and everywhere you find lovely, comfortable furniture. 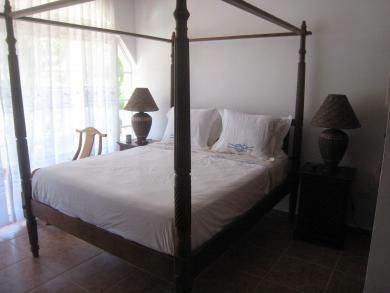 Finally you enter two more bedroom with their own baths one with a nice queen sleigh bed and the master with a 4 post king and private deck (yes, the 3rd one) with ocean views that will wake you to the amazing life you will find as the owner of this dream. •Beautiful distressed furniture and heavy wood beds. •Large open kitchen. ▪ •Downstairs bedroom or office with bath.